Ashok Munne is an amputee. He has only one leg. 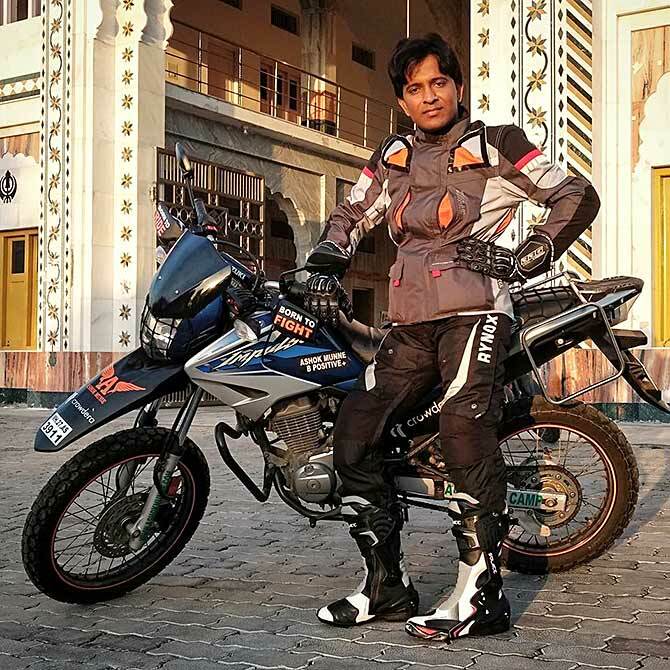 But that hasn't stopped him from riding to Ladakh, taking on Mount Everest or conquering the Himalayas. There is only word to describe his journey -- 'incredible', notes A Ganesh Nadar. Raid de Himalaya has the reputation for being one of the toughest motorsport events in India and the world. While the physically fit find it to be a tough race, imagine someone doing it with one foot. 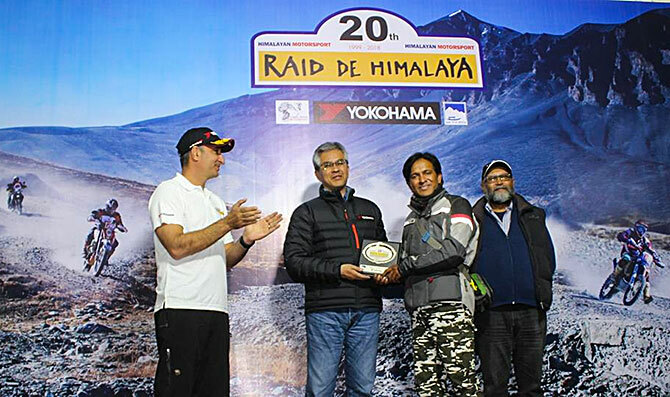 Ashok Munne recently completed Raid de Himalaya. The 34 year old is a mountaineer, an expert para glider, a scuba diver, a marathon runner, a black belt in martial arts, a skilled gymnast and kayaker, yoga expert and an ace swimmer. After completing the Raid de Himalaya in October, he travelled to Delhi to take a train back to Nagpur. Sitting on the crowded New Delhi railway platform, while waiting for his train, Ashok told his story to A Ganesh Nadar/Rediff.com. I went to the Jyotiba Phule high school in Murthy village and studied up to the 12th standard. I worked as a driver at the Rotary club. In 2008, I lost my right leg in a railway accident. I was 24. People were sympathetic. They pitied me. I did not like it. They told me that my life was finished. I wanted to prove them wrong. I had three operations on my leg. The third was paid for by Malti Shastri from the NGO Indradhanu as I had no money. I was bedridden for six weeks. I lost 25 kg. I had asthma as well. In place of my right leg, I got a blade leg. In 2009, a year after the accident, I was watching news on the television. I saw that Krishna Patil, a girl from Pune, had climbed Mount Everest. Her story inspired me. I also decided to climb Mount Everest. And for that, I had to make myself strong. My family was supportive. I had asthma which no doctor could cure. I learnt pranayam and that helped. I started exercising in a small way and slowly increased my time. I wake up at 5 am and cycle to the track field. I cycle up to 15 km every day. On the track I run for 5 km everyday. From there I go to Ambazari lake where all the swimmers in Nagpur practice. I swim 1.5 km every day. I climbed the Mera Peak in Nepal which is at a height of 6476 metres, without oxygen. The Nepal climb was very difficult as it was my first attempt at adventure sports. The weather was bad. The winds were high and the temperature fell to minus 30 degrees. On the penultimate day, I was vomiting blood. We started the final assault on the peak at 2 am in the morning. We reached there at 7.15 am. That is the feeling that keeps me going through every adventure. When you complete all exhaustion is gone it's only happiness and it's like you start glowing. 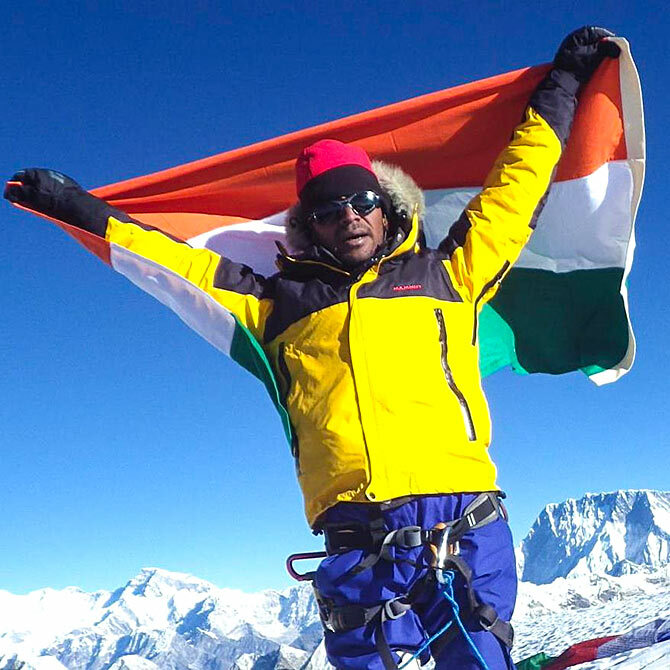 IMAGE: Ashok waves the tricolour after conquering Mount Everest. I could see Mount Everest behind me. I wanted to go up there. I did that in 2016. Fifteen minutes after I reached the top, two Americans came there. They said I was an inspiration. They thought If I could do it, why not us? We took photographs with both the Indian and American flags we had mounted there. After Nepal, getting sponsors was easy. Once they had confidence in you they were ready to sponsor. In 2013, I drove 3,000 kilometres through Ladakh on my motorcycle. 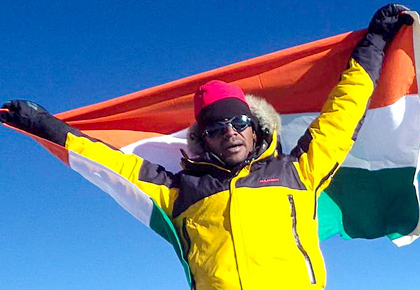 IMAGE: He completed Raid de Himalayas in October 2018. I had read about Raid de Himalayas. I had already biked through Ladakh so I thought I could do it. Since I was handicapped, it took me one month to get a license to participate. Krishna Patil, also my mentor, told them that I had climbed Mount Everest in 2016. They gave me a license on the day before the race. On the first day, October 8, the going was very tough. I was desperate because I wasn't sure I was within the time limit for this stretch. Thankfully, I was on time and relieved. On the second day my timing improved. The third day turned out to be the toughest. I was now enjoying myself. It had snowed, so the road was slippery and dangerous. I was trying to adjust something but I could not. So I took off my helmet and bent down. The helmet fell off the incline and rolled down about 80 feet and floated down a river. It was impossible to go further up without a helmet. So I parked my bike and ran towards the river where my helmet was. I walked into the river and retrieved it. As I was walking back from the river, the locals became curious. They thought I had fallen in with my bike and started helping me. When I stepped out of, I realised that the water was freezing. On the road, I saw that other bikers had stopped by to help me. They were no longer in a hurry to finish the race. It was no longer a competition. We were all in it together and the goal was to complete not compete. One of them gave me a towel to dry. My helmet was also wet. One of the boys suggested that I tie a towel around my head and wear the helmet on top of that. The trick worked and we were on our way up. At the end of day three, I realised there was one more problem. Since the temperature outside was -10C, the water on my head had frozen. The towel was stuck inside. We removed it with great difficulty. I developed slight fever because of the ice on my head. But I didn’t let that bother me. On the fourth day, October 12 when we completed the race, the temperature had dipped to -20C. IMAGE: Ashok co-founded the company Ashok Munne Adventure and Resort that organises trips for individuals and corporate. 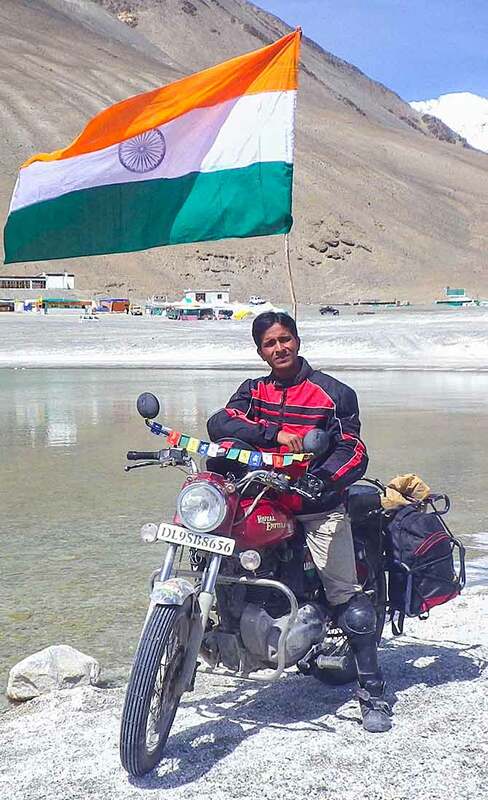 He has also biked to Ladakh, driving up to 3,000 km. I have two younger sisters and an elder sister who is married. My family is very supportive when it comes to adventure sports. They live in a small village. I don't think my parents know how dangerous it sometimes is. I am happy that they don't know or they would worry. For people with disability, my only advice is to self confident. It is very important to portray that you can do it. That you can look after yourself. Don't ask for sympathy. Don't beg. Show them you are capable and sponsors will come to you. 6 months in a coma. 3 years in a wheelchair. But she never gave up.